Okay, look, when it comes to smart luggage, you may immediately look at the technology and consider it overkill. Why do you need your luggage or carry-on bag to be smart? What’s so smart about these devices? How could a piece of luggage possibly offer better and more convenient features? These are all questions you – and everyone else – will wrestle with at the thought of modern smart bags and luggage. But guess what, when you actually go to use it, you’ll be ecstatic you acquired the gear. Why? Several reasons, actually. Many smart bags include a weight or measurement system that will tell you how much and how heavy the items are stored within. This will allow you to discern before you get to the baggage counter, whether or not you need to check your bags. Others, include a power pack or portable battery charger that can be used to juice up your mobile devices, laptop, or tablet. These are a Godsend when you’re stuck at an airport in the middle of nowhere, and you either can’t find a power outlet, or they’re all taken. You can simply plug your device into the luggage, which was designed to accommodate your electronics. Well, yes, some are smart enough to transport themselves. I know, I know, it sounds insane. But there are smart bags that can actually roll along behind you in a terminal, meaning you don’t have to carry, guide, or wheel it around you can focus on what you’re doing instead. Better yet, other bags include GPS or notification alerts to keep you up-to-date on their whereabouts. Considering the World Tracer System for baggage, recorded as many as 24.1 million bags lost and mishandled back in 2014, that’s something you don’t want to happen to you and your gear. Nonsense, you say! None of this is real, you say! Don’t worry, I don’t expect you to take my word for it without offering some proof. What Smart Luggage Follows You? Why bother to get a robot that will carry your stuff, when you can simply pick up a robotic suitcase that will do the same? 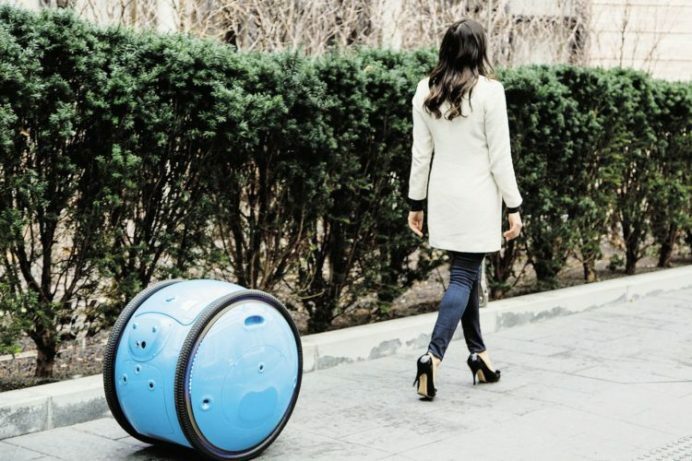 The Travelmate Robotics suitcase line is – as you might have guessed – autonomous. That means it can follow behind you when you travel through an airport, terminal or parking lot. It also senses nearby objects and people and can avoid collisions, so you don’t have to worry about your bag bumping into a ton of people or running over feet. Plus, it includes an integrated weight scale, an LED lighting system, and built-in GPS. The GPS allows you to track its location at all times from a mobile device. So, you’ll know right where your bag is when and if the airline misplaces it. Pretty cool, right? But what about some of the other features we talked about in the intro? What Else Can Smart Luggage Do? For long weekends away, the Bluesmart Black Edition is what you’ll want. It’s a carry-in luggage system that offers everything you could possibly ask for from a “smart” bag. There’s GPS and location tracking because no one likes to lose their luggage, a built-in scale which will not only tell you if your bag is too heavy but will change its maximum weight limit depending on the airline you are travelling with, USB ports so you can charge your phone and an automatic locking system which then unlocks when you are near it connecting to your phone. It is also made with high quality materials so no matter the weather or terrain your luggage and your Bluesmart will stay in great condition. For adventurers, there is the G-RO. It’s outfitted with big off-road wheels which can handle rough terrain. If you like to escape from the office and work in different locations you can take advantage of the G-RO’s massive 23,400mAh battery, which allows you to simultaneously charge your phone and laptop – or another device. Plus, the G-RO has a large interior where you can safely store your clothes and extra belongings. Finally, if security is a priority, Planet Traveler is perfect for you. This case has a fingerprint enabled authenticator which will lock and unlock after detecting the appropriate user info. It also uses a biometric scanner feature within the mobile app to double check your identity before providing access to the bag’s contents. Talk about extra protection, huh? This amazing case will also send text alerts to your phone when it’s ready to retrieve from the luggage carousel at the airport. Therefore, you never have to worry about leaving it behind or forgetting your bag. You can also charge your phone from the 15,000 mAh power bank, or listen to relaxing music via the Bluetooth speakers. Talk about a bag that really takes care of you. In the end though, this is merely a small handful of what smart luggage and related bags can do for you. If you want to know more about some of these cases or have a look at a few others you can do so here.